The swans made a looping circle then headed into the wind, their huge black feet acting as rudders as they came in for a landing. I clicked the hammers back on the Lincoln Jeffries double made five years before Theodore Roosevelt was president. The first shot rocked the 747-sized bird and the second folded him up like a cheap suitcase. The old Damascus-barreled double had been outfitted with a pair of full-length Briley 28-gauge choke tubes, and I had hand-loaded the bismuth ammo. It was a good example of how effective smaller gauges—20, 28 and even the little .410—can be under the right circumstances. Tundra swans are not at all hard to kill; neither are close-in ducks and geese. I repeated the same stunt in Canada hunting with Sean Mann where I took close snow geese with the same combination in a Winchester Model 21 that also gave me the versatility of a 12 for the balance of the hunt. There’s a myth that small-gauge patterns are not as wide as those from heavier artillery. Not so, they shoot a 30" pattern, just thinner. With a smaller gauge, we need to combine downrange pellet energy with a sufficient number of hits (four or five) to bag a duck or goose. My friend the late Gene Hill, one of the 20th century’s great gun writers and storytellers, wrote of killing snow geese in Texas with a .410, selecting only close geese and shooting lead shot. My old Model 42 shoots steel No. 6s well enough to pot a green timber mallard. And plenty of ammomakers, like Federal Premium, Rio, Kent, Winchester, Hevi-Shot and others make bismuth and tungsten-based loads that deliver a wallop. 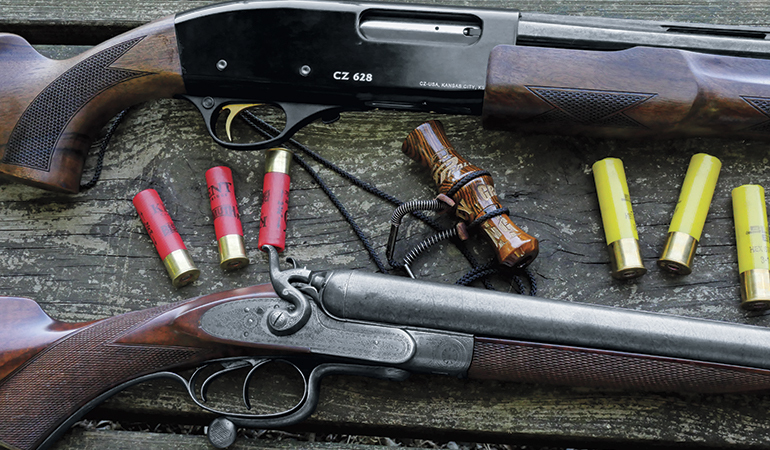 The 28-gauge is a killer so long as ranges are kept modest. This past summer I shot clays with a CZ Model 628 Field Select 28-gauge pump. My first shotgun was a Model 12, and like riding a bicycle, shucking a trombone gun was second nature. The 628 pumps smooth with its twin-action bars and the extended beavertail forend fills my hand, making it lightning fast. Recoil was almost non-existent. The black anodized receiver and highly polished, blued barrel set it off as a handsome piece. Complete with a vent rib and single .005 choke tube, the 628 goes for the couch-change price of $429. Trulock (trulockchokes.com) offers a complete array of chokes for this gun. My goose lease on Maryland’s Eastern Shore is shared with a commercial operation, and more frequently I have been encountering fired 20-gauge hulls in the pits. An excellent choice for young gunners and ladies, although many women I know can handle a 12 with the best of men. Still, its not a bad choice. One of our club members, a retired Vietnam War F-16 pilot turned airline captain, asked for my suggestion on a new waterfowl gun, and the Franchi Affinity came instantly to mind. Sort of the middle child in t he Beretta family bracketed by the A400 and Benelli SBE on the high end and Stoeger 3000/3500 on the low end. The inertia-operated Affinity, now available in 20-gauge, is a steal starting at $789 if you're in the market. I shot an Affinity 12-gauge for a good part of last year’s Maryland goose season, and I fed it a variety of 2 ¾- and 3-inch ammo from all the manufacturers and it didn’t gag once. Clint Eastwood once said, “A man has got to know his limitations.” That goes double for shooting small-gauge guns. At one time writers talked of “barrel-stretching” shots, and that’s something we really shouldn’t do when we’re talking smaller gauges. I know plenty of duck guides who carry a 20 all season, and can kill mallards beyond the edge of the decoys, but that doesn't mean you should try it. Know your shooting capabilities and the effectiveness of the shotshell in your gun, and stick to them. Some would say I was a fool for attempting swan and geese with a 28-gauge, but I took my time to pick close shots, all well within 30 yards, because it’s the impact of multiple pellets at a killing velocity that does the work. Once the gun goes bang it’s a matter of shooting skill and downrange ballistics. 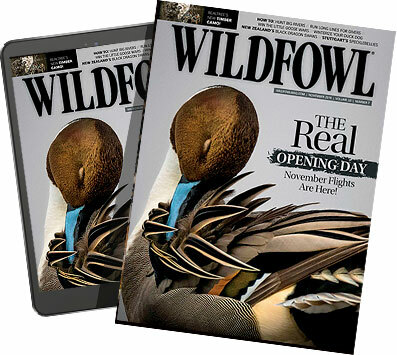 We live in an era of advanced shotshells carrying pellets—bismuth and tungsten—that were not even thought of 50 years ago, not to mention buffering, plastic wads in their infancy, etc. So whatever ammo we choose, it’s the best. We all want to be responsible hunters, so if small gauges are your choice, spend time shooting patterns with the ammo you will take afield so you know what your gun will do at various ranges. And don’t forget shooting a smaller gauge demands good sportsmanship to not stretch the barrel beyond the effective range of a shotshell. Don’t forget the old adage: Kill clean or miss clean. Good luck and stay safe!